I have a billion things I should be doing this morning. 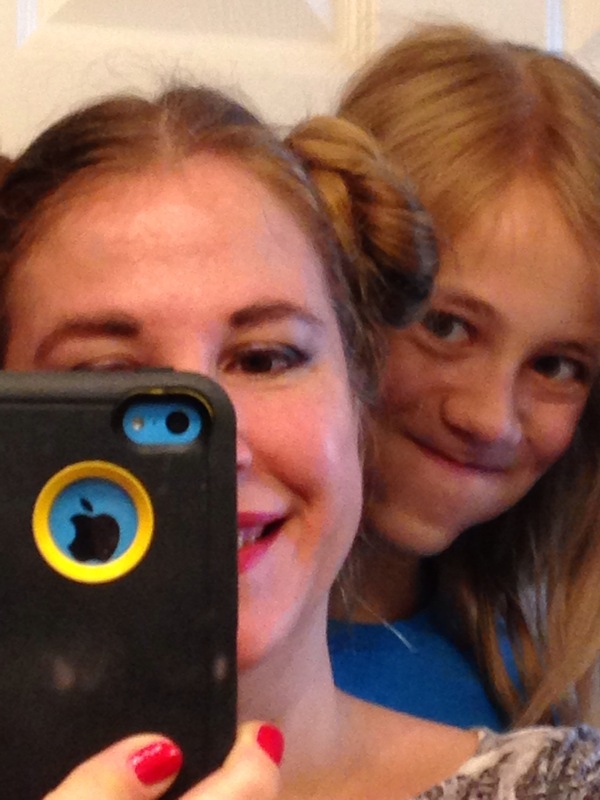 Not a single item on my list has anything to do with trying to create Princess Leia buns again. But that’s exactly what I did. We have tickets to see Star Wars: The Force Awakens this week. I don’t know if we really NEED to see it opening day. I’ve gotten a little wishy-washy about seeing movies on opening day. I need my sleep. But there are enough potential surprises in Force Awakens that I don’t want any spoilers. I’ve been purposely avoiding articles on overseas trailers and such to keep myself guessing. I like it that way. 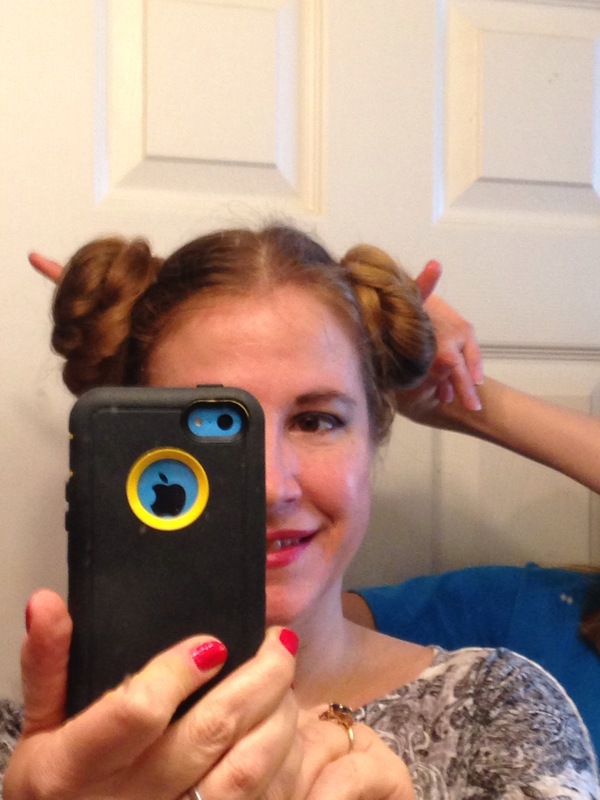 Opening day is also the perfect time to wear Princess-Leia-Cinna Buns. My hair is totally long enough to pull it off, but not nearly thick enough. So I tried a couple of buns using a pair of socks as a foundation. It worked a lot better than I thought it would. I was expecting to have a hard time wrapping my hair to adequately cover the sock, but it wasn’t bad. It took only a few minutes. It helps that I regularly wear my hair up, and I have gobs of practice putting my daughter’s hair in a bun for her ballet classes. Practice makes perfect (or at least pretty darn good). One sock is sticking out a little in the back on my right bun, but I’m pretty sure I can fix that kind of thing on the actual day of the movie. I used dark socks so that bright white bits wouldn’t stick out. Brown or tan socks would probably work best in my hair, but I used black ones with small green dots because that’s what I had handy (and clean). If a sock pops out it may look more like a green-spotted black slug is hatching from my buns than some form of underwear breaking free. I think that’s better. Ya know, like maybe a space slug or something. It could work. I was inspired to try the buns again this week when I read a blurb about Billie Lourd. She’s Carrie Fisher’s daughter and will appear in the new Star Wars movie wearing her own rendition of the classic Leia duo buns. Apparently she’s also in a show called Scream Queens where she regularly wears ear muffs as an homage to her mom’s awesome roll as Princess Leia. (Strongest character in Star Wars!) I’ve never seen Scream Queens but am temped to check it out just to see the ear muffs. I’m pretty happy with the sock-enhanced buns. Now I’m trying to figure out if I should attempt to go out of the house like this today. Maybe I will. Maybe I won’t. My daughter is helping me make the most of my buns. First with bunny ears, then antlers, then her own awesome silly face. No cinnamon was harmed in the making of these buns.